The Rangers return home looking to snap out of a losing streak when they host the Philadelphia Flyers on the 50th anniversary of their first game at the current Madison Square Garden, which ended in a 3-1 victory over the Flyers. New York dropped a 6-3 decision Saturday afternoon in Ottawa. Michael Grabner scored twice and Mika Zibanejad once, while Brandon Halverson made his NHL debut in relief of Henrik Lundqvist. Despite allowing five goals and with the quick turnaround, Alain Vigneault confirmed Lundqvist will make the start against the Flyers. The Blueshirts were victorious in the only meeting of the season against the Flyers, a 5-1 win back on Jan. 16 at The Garden. The Flyers are right in the thick of the playoff race in the Metropolitan Division, jockeying for position at the top of the division with Washington, Pittsburgh and the Devils. Philadelphia comes into Sunday's game with five wins in its last six games, including a 2-1 overtime win Friday night against the Blue Jackets in Columbus. Claude Giroux leads the club with 66 points in 58 games, followed closely by Jakub Voracek's 65. Sean Couturier is having a breakout offensive season with 29 goals and 29 assists for 58 points, all of which are career-highs. No. 1 netminder Brian Elliott is out long-term following surgery on a core muscle, paving the way for Michal Neuvirth to man the net. So far, so good, as the netminder has three wins in his last four games, with the only blemish a shootout loss to the Devils on Tuesday. Despite the poor outing on Saturday, Lundqvist has great numbers against the Flyers for his career, including as of late. The netminder is 9-1-1 in his last 11 appearances against the Flyers, and 21-4-1 against Philadelphia since March 6, 2011. Overall, he's 35-14-4 with four shutouts against the Flyers for his career. Giroux saw his four-game point streak snapped on Friday, but prior to that he had been red-hot with goals in all four games to go along with four assists. The captain is having his best offensive season since he posted 86 points in 82 games during the 2013-14 season, and has already eclipsed his stats from last year. The Rangers have won seven of their last eight games against Philadelphia, dating back to Jan. 16, 2016 (7-1-0 record). The Blueshirts have also earned at least one point in 12 of their last 15 games against the Flyers, dating back to Mar. 26, 2014 (11-3-1 record). Will they give up a goal in the first minute? First 5 minutes? Will Jesper be a -6 today? 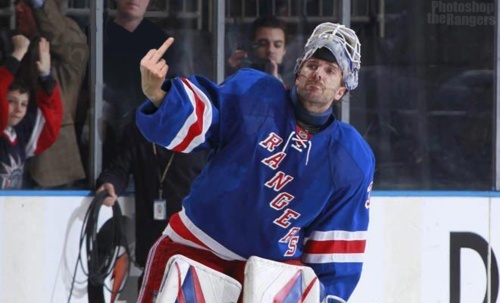 Will Henrik finally lose it and tell AV to **** off? Stay tuned for another episode of, "The Dumb and the Restless". Good luck Hank I hope you have your rubber repellent on. A Hail Mary goes in. Nice hands by Hayes. He definitely should be a 4th line winger. Location: 17 miles from MSG Hayes with a crazy redirection off a Sproul shot - Rangers leading!!!!!!! 1-0 in the first 2 minutes!!!! Hayes with a crazy redirection off a Sproul shot - Rangers leading!!!!!!! 1-0 in the first 2 minutes!!!! Things develop differently when you actually start a game with some intensity and physical edge. Location: AV is gone Yay! Mill doesn’t clear Cody watches bing and in. Trade Miller already. He’s just dumb. Unless a new coach can get through to him, he’s Kovalev without the skill. And his off wing. It’s a race to see who’s gone first him or chewy. Somebody needs to let the angry JT out. If he gets a few penalties, who cares, especially now. Notice how polite the Flyers are around Macleod. Imagine if the Rangers had a few more physical players, especially on defense. Guys like Gilmore and Sproul are not physical enough to be positive impacts on this team. I don’t get the Ranger wingers not getting to the boards when the d gets the puck behind the goal line, they stand 10 feet from the boards and watch the puck go around the boards to the opposing dman. So basic yet it’s the downfall of the Rangers in their end. You mean like the fuking idiot behind the bench. Holden holds the puck too long. Ironic. Location: AV is gone The big man! Trade value! That’s the type of goal that the Rangers never get against the Islanders, because the Isles are nasty in front of their net. The Rangers lead the league in little guys who are willing to scrap, and big guys who aren’t. Location: AV is gone OMG TV why is it NEVER Henriks fault when he gives up a goal? 2 dmen in front don’t touch the flyer he tips it in. Sproul and Gilmour are finally getting a full grasp of chewy hockey. Gilmour very noticeable and I’m not sure he hasn’t been their best defenseman since he’s been called up. Location: 17 miles from MSG Manning is the trailer with a nice finish, 3-2. where were the other 2 Rangers??? Manning is the trailer with a nice finish, 3-2. where were the other 2 Rangers??? Location: AV is gone The Peter Holland show...Zuc trade value! Frodo shot the puck ??!!? Location: 17 miles from MSG Holland with a great pass to Zuc for a SHORTY?!? Henrek hoping to chip away at his 6.43 goals against average. Location: AV is gone What was the over/under for this game? He got a couple of shots in...He has Heart! He showed up and he’s still alive. How'd MJ make out with his surgery? Not possible. Fake news. I’m told he’s our future captain. They can not trade Holden soon enough. Anyone catch Lyon defending his turf? Take notes Henrik. Holland for MVP. Miller with the blast. PLEASE -- get rid of that horrendous goal song!!!! Nope...the question was...who is better offensively than Just Turnovers....and Zib certainly is. No one said he was one of our best players. The bar is quite low. It’s understandable how you and your junkie friend get all confused from the whole reading thing. Chewy whispering in Scott’s ear(making sure little Quickie isn’t looking) I think we found our number one center. Don't get all excited Mrs Mamdar I don't mean it like that! Well, if Jesper Minus Five can have an “A”, anything is possible. Very prescious of you with the “she” and “Mrs” verbiage. I bet when you get to 9th grade, you’ll be one of the cool kids. Location: AV is gone Why does Doc always have to tell us who's F'n Birthday it is? Rangers getting dirty goals in close to the net. Flyers’ coach is clearly not happy about that in his interview with Joe. Games are won and lost within 10 feet of the crease. Something that AV still hasn’t learned despite all his regular season wins. Haha, that was much easier than I thought!!! Flyers cycle for a full minute and not ONE HIT thrown by a Ranger to break up the cycle or the skating of the Flyers. I hate AV with a white hot hatred that dwarfs the sun. Same. Looks like we are on the same page. Location: AV is gone Hook? Henrik looks tired and slow. Wonder why? Fast is like a three-legged kitten with arthritis on his skates. Has no leg drive whatsoever. Someone teach him to do squats, please. Rangers playing no-hit defense like they’re on the PK instead of even strength. The Process. But - you will notice that they rarely get penalized!! He is pretty good at knee bends. Anyone notice the number of players in the press box is relative to the number of penalties they take? Flyers have a lot of their 1st round picks playing today. How many do the Rangers have playing today? They take SOFT penalties. Tripping, holding, etc. I’d rather see nasty penalties in the defensive zone. Roughing, high sticking, cross checking. If you’re gonna sit for 2 minutes you might as well send a message that standing in front of our net is gonna hurt. The US Women's Olympic Team is more physical. Satellite down, no fire AV chant yet? will he be moved to the fourth line? The whole team is in brokedown mode, the coach and the guy that deserves a lot of the blame one chewy Herb, has to go, now. NO! at this point they need him to keep this team going in the right direction. What exactly change of the coach is going to do, besides satisfying hot headed fans? He will be fired but after the end of this season. Which make much more sense. There is zero reason to keep him. This season is done. They have to see what players they will come up with and choose what style of play they going to go with only after that they have to choose coach. To be honest, I'd rather see Sather mop up. Run along little troll, go play on a road somewhere. C'mon Jeffery get moving !!!!!! I don't think that would happen with Sather, but they need a change and some positive energy in the room, we've talked before Shonfeld would be my choice, because he's a hell of a coach, but he probably feels pretty safe where he is. So at this point in time, and only if they are filling in til the end of the season, Ruff, Arniel, Drury, Beukeboom anybody. That is exactly what i am talking about it. As soon as you have different opinion you become troll or something else. When we cannot hold intellectual debate we using name calling as argument. Your first post criticizes anyone who doesn't agree with your save the coach platform as a "hot headed fan". And now your feelings are hurt, because you got called a troll. Boo hoo hit up aisle 14 at a Walmart grocery they have scotties softies for you.. "We"??? You supposedly just got here 4 messages ago - please tell us what "debates" you're referring to.